I have been following your advice and I saw your last column about why people seem to break up over the holidays! It’s now the New Year and I think it’s time to let go from a dead-end relationship after re-reading your advice. Here is my situation. I have been on and off with the same man for over six years. I love him, but deep down I know he isn’t the man for me for the rest of my life. We have different needs, and I’m not very happy. It has been difficult to let go since we are so attached yet I am still miserable. We tried living together for a year and I moved out and bought my own place. We still see each other every other week and my friends all say I am crazy since this relationship is going nowhere. Now that I am not living with him, I have had many other men pursuing me. I try to date, but I feel guilty and I can’t let any other man close to me. Half of me wants to be free, and the other part is afraid to let him go for fear of being alone. I don’t want to hurt him if I really start going out more seriously with another man, but I know it is time to move on. It’s hard to know what to do, but I do know that he isn’t the right partner forever. How can I let go and move on without hurting him, and let go of my fears? I need HELP. I know it is hard to let go, but you are living like a person who is separated from a marriage…and in a STUCK place that does not let you live your life with passion. You want to be free but you are NOT! I have been there and done that and wasted years of my life hoping for a shift to happen…but SIX YEARS! Girl…get some support and move on with your life! After years of working with singles, this MIS-TAKE is the one that keeps most people stuck and does not allow you to achieve your goals. Think about how much frustration it has caused you to stay? How many years have gone by that you might have been able to meet someone else that rocks your world? Although you have history, it sounds like you are very clear that this relationship does not fulfill your goals in love. Why do accept less than what you really want for yourself, my friend? And by not being honest with him you keep him stuck as well. Trust and listen to your soul guiding you to move on. Be grateful for the love you shared and communicate the total truth to this man so he knows what is happening and he can move on. Be honest and Get Real with people in your life. You can’t start out new relationships with dishonesty and expect to meet anyone since they eventually will discover you still are seeing your current boyfriend. Set yourself free and have faith in yourself that once you are really single, you’ll have a clean space to explore and attract a person that is more compatible with you. Create a support team to get you through the times when you would have been with him. Realize once the space is clear you can be assured new experiences will come your way! Get a coach to help you examine your new goals so you don’t waste time in the future. The fear of getting back out there and being on your own may seem bigger than being unhappy with a person that you are comfortable with. You must move forward with a clean slate or you’ll be writing to me in a few years with the same story and still feeling unfulfilled. There are so many great people to meet. So, trust in yourself and forge ahead. I am here to support you and anyone with my heart opening seminars, events, personal consultations and heart healing sessions to assist you on your path. 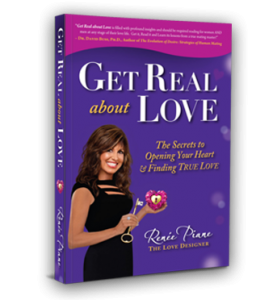 I can help keep your heart open to find real love! I have regular Love support groups and various classes and services to help you on your path. My Book “Get Real about LOVE The Secrets to Opening your Heart & Finding True LOVE!” will help you look at your patterns that have stopped you from achieving your goals. It’s available on Amazon! and on Audible Get Real and call me if are serious about finding love. Have a burning question? Need help with any dating concerns or have a relationship challenge? Need a Love Tune up or healing from a broken heart? Send in your questions to Renee at or contact me at my office at 310 827-1100 for a Free 20-minute consultation or a heart healing session if you need support. Speak your truth, set new intentions and your dreams can come true.